Last September, my wife and I were enjoying date-night browsing the shelves of Barnes and Noble when Bitayavon Magazine jumped out and caught our attention. Bitayavon magazine celebrates kosher cooking with a modern and revolutionary approach, presenting each dish with an easy to prepare recipe and professionally shot food-photography. Highly acclaimed chefs Laura Frankel, Seth Warshaw and Jeff Nathan have been featured in Bitayavon, and this month, readers of This American Bite can win a free subscription to this wonderful magazine. To get a taste of the magazine, Bitayavon has shared a Green Bean Salad with Honey Mustard Basil Dressing. This dish will serve six. 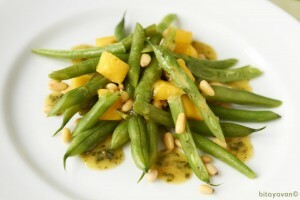 This appealing salad utilizes green beans, mango and basil in a creative way that will wow your palate. The dressing is great as a marinade for fish and chicken and as a dipping sauce. Place green beans in a pot of boiling water for about a minute and quickly drain and then let cool. Blend basil, mustard, honey, lemon juice, garlic cloves and oil. Alternatively, finely chop basil and garlic and place in container, then add mustard, honey, lemon juice and oil and shake vigorously. Dressing can be refrigerated until ready to use. Place cooled green beans, mangos/peaches in a salad bowl. Pour dressing atop salad ingredients. Sprinkle with pine nuts and serve.